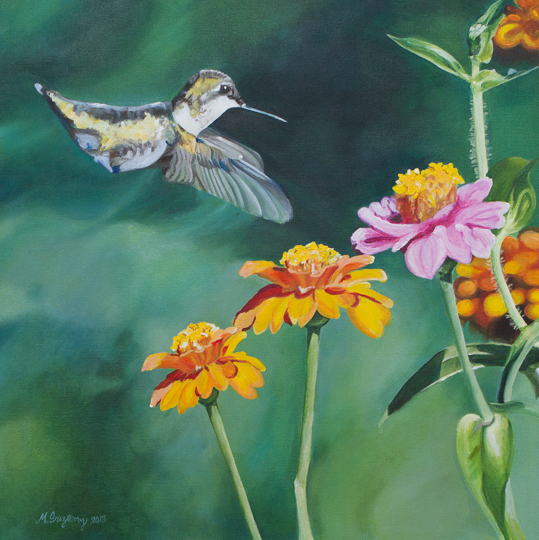 Here is my latest acrylic painting of a hummingbird and some flowers. It is on 24 x 24 inch gallery-wrapped canvas. There's some iridescent color in the bird's body that is not obvious in the picture but it's subtle and makes it shine in real life. This one was fun to do, especially bird and background. I used Chroma Interactive Acrylics for the background so that I could have more blending control. Speaking of which, you can get some FREE samples of this acrylic paint by going to Chroma's facebook page. They sent me (3) 20 ml sample tubes of paint: a red, a white and a black. Great for making black and white paintings to try out the paints. The advantage of this paint is that you have some degree of control over drying times. You can use it as regular acrylics, which dry VERY fast. Or you can mist it with water to extend drying times beyond those or regular acrylics. There's a special medium that allows for even slower drying times. This paint is also very creamy unlike some other acrylic paints which tend to look too plastic. Anyway, going to be working on a still life in oils I started a while back. I looove oil painting but can't deny that acrylics have very clear advantages over oils. Although the final result for the two can look quite similar, they both have to be handled very differently. It's hard for my brain sometimes to do the switch from one to the other right away, so I may do a little watercolor in between.